Plains bison have since been reintroduced into a number of locations around North America. Five main foundation herds of American bison supplied animals intended to save them from extinction. The northernmost introduction occurred in 1928 when the Alaska Game Commission brought bison to the area of present-day Delta Junction. Bison taken from this transplant were also introduced to other Alaska locations, including Farewell and Chitina. The Delta Junction herd prospered the most, with a population of several hundred throughout the late 20th century. This herd is popular with hunters interested in hundreds of pounds of high-quality meat, but has been a problem for farming operations in the area. 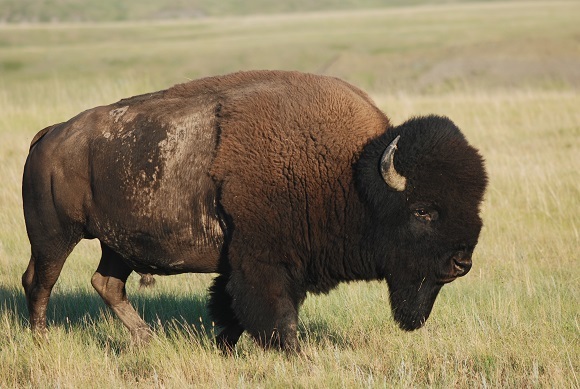 Though American bison generally prefer grasslands and plains habitats, they are quite adaptable and live in conditions ranging from desert to forested areas. Currently, over 500,000 bison are spread over the United States and Canada. However, most of these are on private ranches, and some of them have small amounts of hybridized cattle genes. In 2006, Plains bison from Elk Island National Park in Alberta were released into Saskatchewan's Grasslands National Park. This marks the first time Plains bison have wandered the short grass prairies of Canada since their near-extinction at the turn of the 20th century. According to the national agency Parks Canada, the entire breeding population of these wild and “semi wild” bison is the descendants of just eight individuals that survived the period of near-extinction. One Plains bison herd was established in Texas. A remnant of the last of this herd had been saved in 1876. "Molly" Goodnight had encouraged her rancher husband, Charles Goodnight, to save some of the last bison which were taking refuge in the Texas Panhandle. By saving these few Plains bison, she was able to establish a buffalo herd near the Palo Duro Canyon.